Magical Blogorail: Avoiding the “I’ve got to do everything” trap! Welcome to this month’s Blogorail Blue Loop. Today we sharing tips for your first Disney vacation. Hello everyone, and welcome to this month’s Magical Blogorail look at tips for your first Disney Vacation! You’ve been saving your money, you’ve been paying regularly on your trip, hopefully you have been working with a travel agent to help you plan your trip and save you money, and now, it is finally here! Your Walt Disney World vacation is about to begin! When you arrive, though, sometimes your thoughts get the better of you. You think to yourself, I spent so much for this trip, I’ve got to see absolutely everything in order to get my money’s worth. That line of thinking, though, is incorrect, and hopefully in this Magical Blogorail post, I’m going to share with you some things that will help you prevent the feeling of not seeing anything and keep you from falling into that trap. 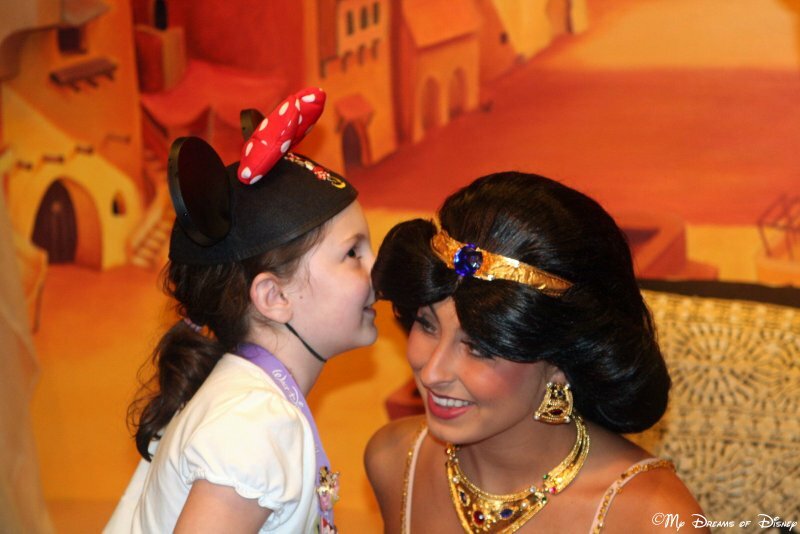 Our daughter Sophie shares a secret with Princess Jasmine! As great as the attractions are at Walt Disney World, what will really make or break your trip is the memories that you and your family create while there. The picture above was taken way back in 2008, and to this day, it remains one of my all time favorite Disney photos. Let me set the scene. We were in Morocco just wandering through the marketplace, looking at things, just browsing. When we got to the back of the pavilion, there was a meet and greet location, with Princess Jasmine and the Genie just waiting for someone to come visit with them. Sophie had been talking about Princess Jasmine all this time, about how she was going to get a costume just like her costume, and she was able to talk with her for what felt like an eternity! In this picture, she was telling her that she was going to get that costume, and sure enough, she did a couple of days later. Far too often, first time guests — and yes, even those that visit more regularly — are way too focused on getting from point a to point b, from getting from their last attraction to their next attraction, and they don’t really slow down to breath. Part of the reason you are taking your Disney vacation is to take a break from everyday life, from getting away from the rat race that is the world today. Let your vacation be just that, a break from the hustle and bustle of life, and instead, take time to enjoy everything about your trip. The picture above was taken back in 2010, when we were leaving Test Track and heading somewhere — I don’t even remember where. 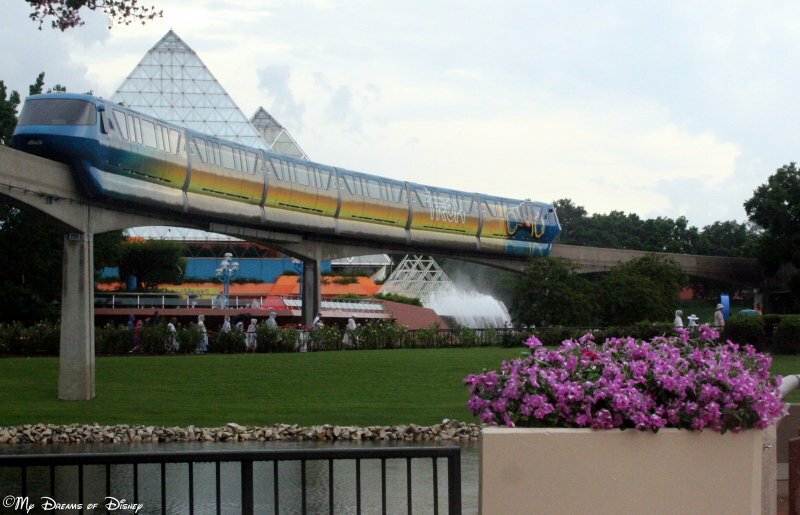 Anyway, we weren’t in a very big hurry, and if we had been, we might have missed the perfect setting of the flowers, pond, TRON Monorail, and the Imagination Pavilion in the background. I love this photo, and hope you do as well! Tip 3: Enjoy the little attractions as much as the big ones. As much fun as I have riding Space Mountain, Big Thunder Mountain Railroad, Seven Dwarfs Mine Train, and the other big attractions, I get as much fun out of the smaller attractions, the ones you can almost walk right on. Carousel of Progress, Mickey’s PhilharMagic, it’s a small world, Gran Fiesta Tour Starring The Three Caballeros, and so forth. Don’t overlook the little attractions just so you can enjoy the big ones. You will be doing yourself and your vacation a disservice, and you will miss out on a lot of great opportunities to let the child within out to play. 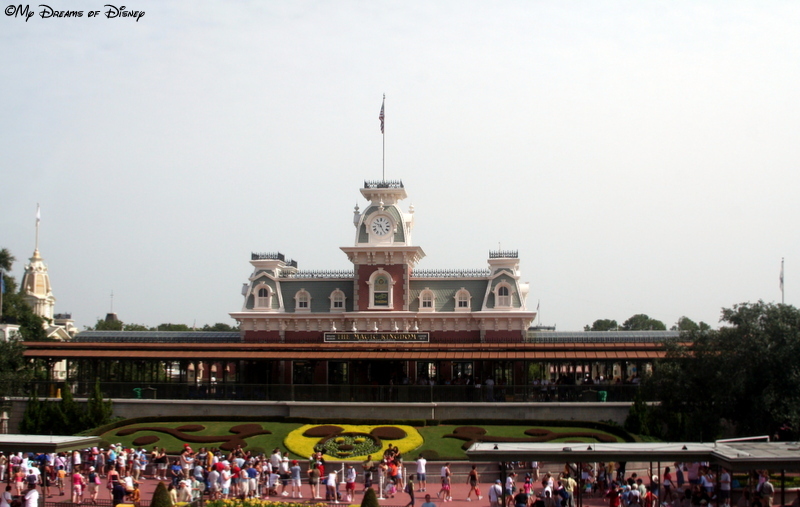 I hope that this post has been helpful to you as you plan your first Disney Vacation! Let me know what you think in the comments below, and thanks for stopping by today! Check out the rest of the posts from the Magical Blogorail writers, and then go out and make it a Disney day! 3rd Stop – My Dreams of Disney | Avoiding the “I’ve got to do everything” trap! Live Music Memories on Main Street, U.S.A. Welcome to this month’s Blogorail Orange Loop. Today we are sharing some of the best live entertainment at the Disney Parks. 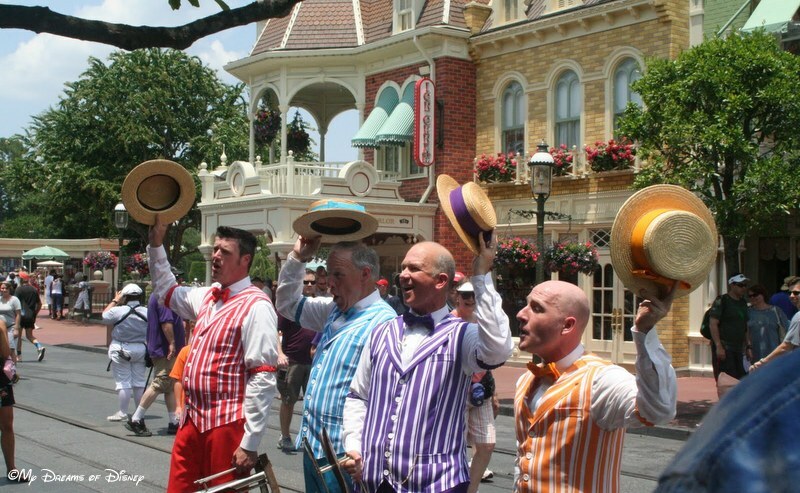 The Dapper Dans share some of their talent with us on Main Street, U.S.A. When it comes to Disney, for me and my family we have always enjoyed and thought that the music from the parks can lead to an even greater enjoyment of all that we see. Today I’m sharing with you some of my favorite music memories from Main Street, U.S.A. and even beyond! 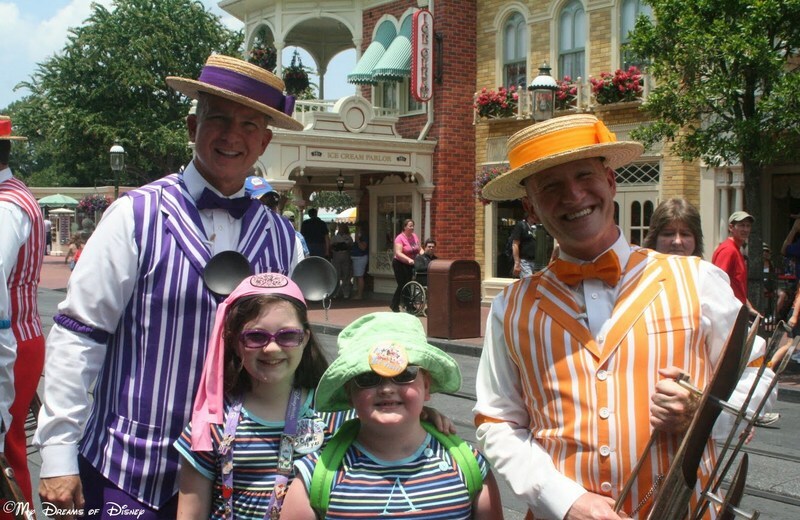 The picture you see at the beginning is of the Dapper Dans as they performed for us on Main Street, U.S.A. After they had finished, they were kind enough to share a picture with my daughter Sophie and niece Anna Jane, as you see here. The Dapper Dans with Sophie & Anna Jane! 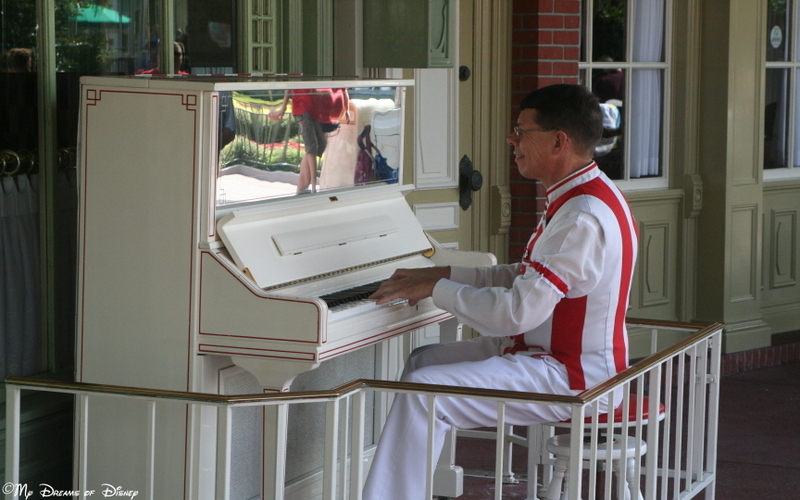 As you progress up Main Street, take a look at the piano situated over by Casey’s Corner. The piano has a player, and they will appear at various times throughout the day, so check your times guide for the day you are there. It’s a great way to sit down, relax, and let the music take you back in time to another age. Simply put, it’s just one of the music memories you’ll experience on this journey. If you haven’t heard the Main Street Philharmonic perform, then make sure you save some time for a listen. Their music is really good, and among the best of any band you’ll hear anywhere! 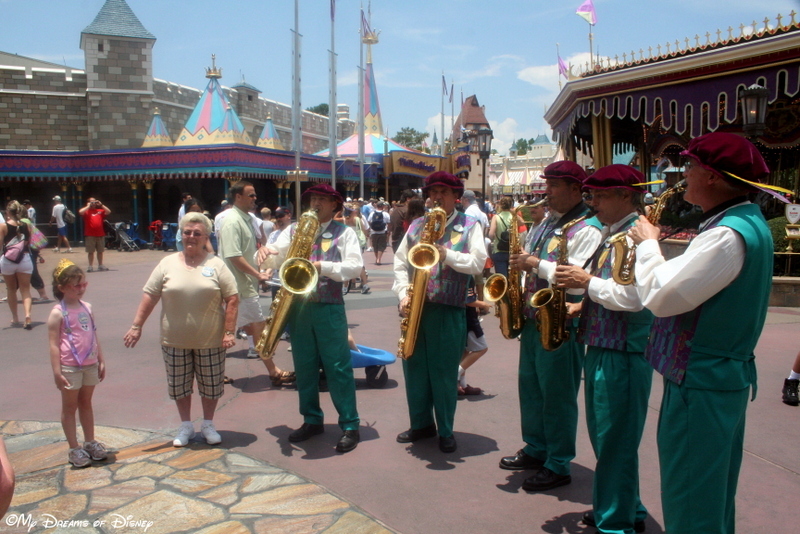 Then, over in Fantasyland, one of my memories was when the Fantasyland Woodwinds Society (I think I have the name correct) performed Happy Birthday for Sophie and this other lady who’s birthday it was also. Here’s a picture from that day. 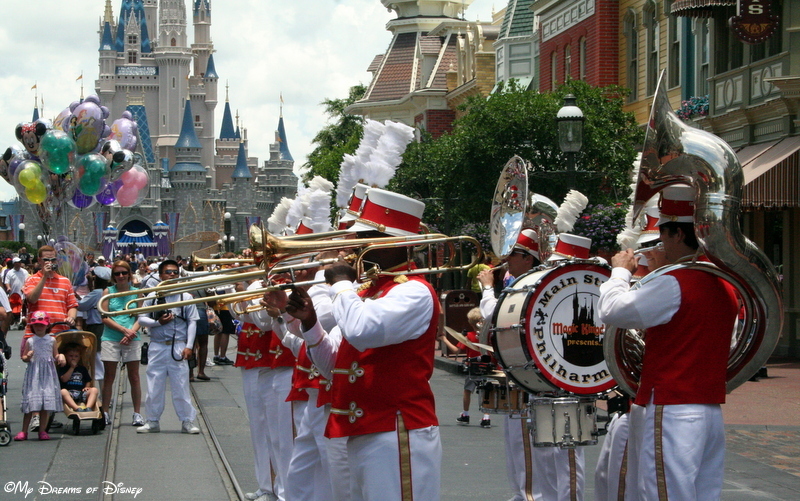 What music do you like to see performed at Walt Disney World? Let us know in the comments below, and thanks for stopping by today! 2nd Stop – My Dreams of Disney | Live Music Memories on Main Street, U.S.A.